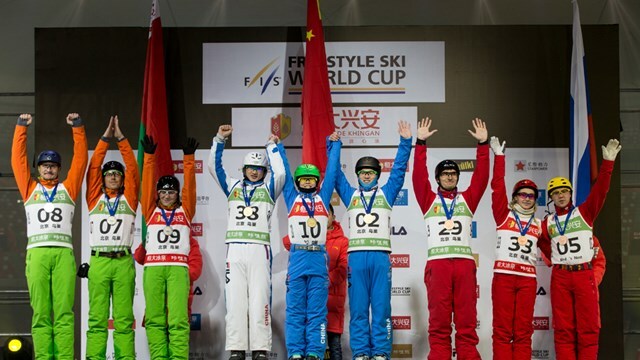 Beijing, China – After taking the win in Saturday’s individual competition, Ashley Caldwell, of Ashburn, Va., earned herself another World Cup podium in Beijing, finishing second in the qualifying round of Sunday’s team event. The U.S. was unable to qualify for a spot in the team event finals as China took the women’s win in front of a home crowd. With a mistake on the take off, Caldwell’s full, full, full wasn’t her best jump of the weekend. But she was able to secure the landing and take home her eighth career World Cup podium. On the women’s side, China’s Fanyu Kong and Huilin Wuan also earned podium spots during the qualification round, finishing first and third. Belarus’ Maxim Gustik, Australia’s David Morris and Ukraine’s Oleksandr Abramenko were the top jumpers in qualifying for the men. Jonathon Lillis, of Rochester, N.Y., was the top U.S. men’s finisher in 15th. The aerials team event was a new addition to the World Cup tour last season. After completing a qualification jump, which counts as a World Cup result, athletes are put into teams of three based on qualification results. Each athlete within the team gets one jump and their individual scores are combined for a grand total. Caldwell and Australia’s David Morris, who finished second in Sunday’s qualifications, leave Beijing in the overall Aerials World Cup top spots. Two teams from China, two teams from Belarus, one from Russia and one from Australia went on to the women’s team event finals. Team China 1, consisting of Fanyu Kong, Guangpu Qi and Zhongquing Liu, took home the win with a combined score of 329.55. On the men’s side of the team event, with maximum pressure on, China’s Zhongqing Liu landed a perfect back full double full full to claim the highest score of the day with 128.76 points. Dropping as the last man for Russia, Vasily Polenov slapped back on his back full full full and it was clear that it was only Belarus’ Maxim Gustik who could steal the win from the local favorites. However, Gustik wasn’t able to put down a clean run, catching the edge of his ski on the landing, and his 102.21 points were only enough to secure Belarus the second place. The FIS Freestyle aerials World Cup tour moves next to Lake Placid, N.Y. for the Putnam Investments Freestyle Cup January 14-16.